The Carter Center has developed many resources to help citizens and election observers apply an obligations-based framework to real elections around the world. A Long Term Observer (LTO) Weekly Reporting Template used by long-term observers to assess the political environment of a country prior to elections. A Campaign Rally Report Template intended to evaluate the nature and atmosphere of any political rallies that are held. An Incident Report Template to record important incidents observed during the electoral process. A Case File Report Template for reporting any complaints, violations, and/or irregularities that occur during the observation process. Election Day Checklists (Ghana) used to assess opening, polling, closing, and vote counting processes. The following schedules outline the sessions and main topics included in The Carter Center’s training of short-term and long-term election observers. 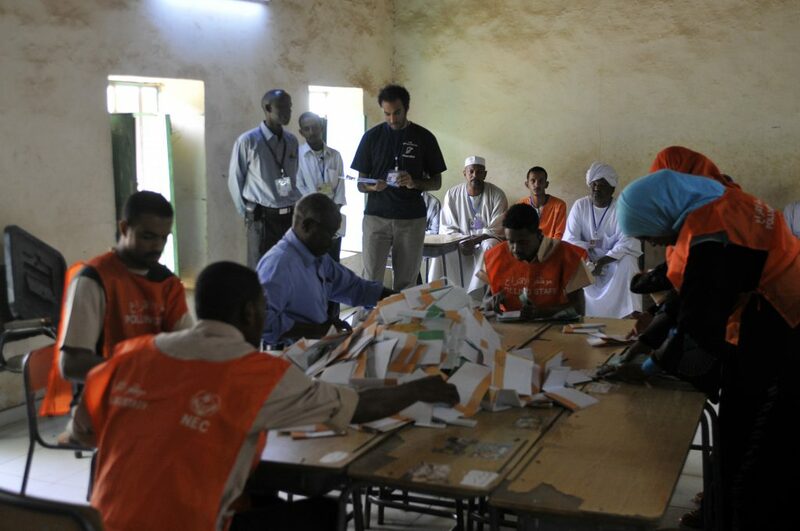 A Carter Center observer in Sudan completes a checklist during the vote counting process. The following materials are intended to help citizen and international observer organizations use their recommendations to report to the United Nations treaty monitoring and Universal Periodic Review (UPR) processes. A UPR Training Manual and PowerPoints authored by The Carter Center and the Office of the High Commission for Human Rights, and intended to help human rights organizations of all types understand and effectively contribute to the UPR process.